AWCW90F is a heifer calf out of an Anaconda daughter with Scorpion on the dam side. Anaconda 37 lbs @2yrs, 100 lbs @ 5yrs, 671" @ 6yrs. 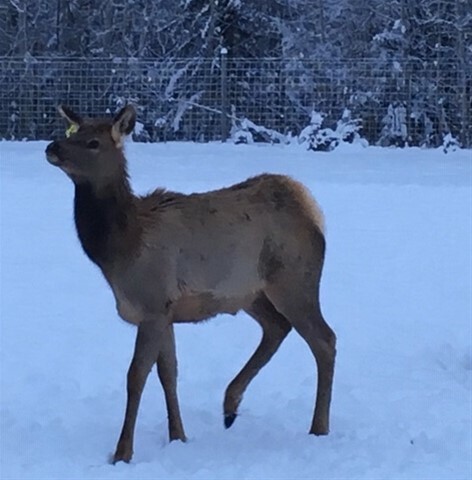 AWCW90F's sire SUREFIRE AWCW2B was 416" NT at 2 yrs- 1st place 2017 Alberta Expo 2yr NT, 1st place 2017 NAEBA International 2 yr NT. 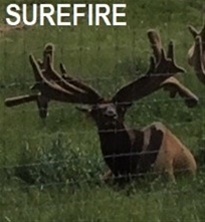 Surefire at 3 yrs - both antlers damaged, 559" NT on head at 4yrs with 82" outside spread. Surefire's dam was a Cobra daughter. Sire AFRI26S - 47 lbs @5 yrs, 552" typical at mature.